The 225-566 Battery Operated Psychrometer quickly and easily measures wet-bulb and dry-bulb temperatures. The instrument is self-contained and portable. Two models are available: the 225-566F with a range of +10° to +120°F and the 225-566C with a range of -15° to +45°C. The 225-566 Battery Operated Psychrometer quickly and easily measures wet-bulb and dry-bulb temperatures. 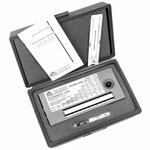 These can be converted into relative humidity or dew point temperature using a chart on the instrument face, a psychrometric slide rule (provided), or tables (also provided) for a more accurate determination. The instrument is self-contained and portable. It is small enough to be hand-held, but has an opening on the rear of the plastic case for wall-mounting if required. Three "D" cell batteries provide power for up to 1,000 observations. The instrument is designed to meet federal specification GG-P-725B type III style B. It consists of a matched pair of 8" long thermometers, a permanent magnet fan motor, a two ounce plastic water bottle, and an illuminating lamp. The small fan creates an air flow of 15 feet/second over the thermometer bulbs and the lamp illuminates the thermometers from behind. Two models are available: the 225-566F with a range of +10° to +120°F and the 225-566C with a range of -15° to +45°C.